Sail from the Danube Delta of the Black Sea to Hungary’s capital of Budapest through the Balkans, Hungary, and Austria on your European river cruise. Begin with an overnight stay in Bucharest for a guided sightseeing tour, including the Royal Palace Square. Travel to Fetesti to embark on your Danube River cruise, beginning with the Danube Delta preserve. Sail through the striking landscapes of the Balkans-Rousse, Bulgaria, Veliko Trnovo, and Arbanassi, one of the oldest towns in Bulgaria. Guided sightseeing in Vidin is followed by a guided tour of Belogradchik, with its ancient fortress and tremendous rock formations on the Balkan Mountains. After cruising through the narrow Iron Gates Gorge visit Lepenski Vir for a guided tour with ancient archaeological finds. In Serbia, take a guided tour of Belgrade, including one of the world’s largest Orthodox churches, and see the most preserved Croatian fortress in Osijek. You’ll also attend a stirring performance by young students of the Franjo Kuhac music school. Tour the historic town of Pécs before sightseeing in the Hungarian capital of Budapest-the “Pearl of the Danube.” You’ll take a guided walk through Bratislava, Slovakia before cruising to Vienna-the city of music. Enjoy guided sightseeing of Vienna’s historic Habsburg Empire-including the Imperial Palace, Vienna Opera House, and stunning St. Stephen’s Cathedral. Visit delightful Dürnstein and Melk-charming towns in the vineyard-rich Wachau Valley. Take a guided tour and hear the legendary tale of King Richard the Lionheart in Dürnstein, and tour the magnificent Benedictine Abbey high above Melk. Visit Austria’s lovely city of Linz with a tour of the city’s historic sites, then pass through the horseshoe bend of the Danube-the beautiful Schlögen Oxbow-on your way to Passau. 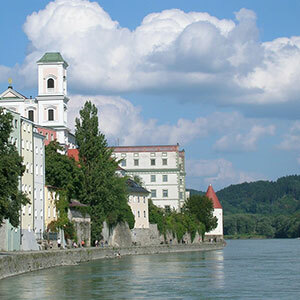 Enjoy a guided walking tour of Germany’s “City of Three Rivers before cruising to Deggendorf, Germany, for the conclusion of your Danube River cruise. The city of Bratislava holds a rich history for Hungary and its surrounding countries. Visit the castle of Bratislava, built in the 9th century, it was once home to Hungarian royalty, until a fire nearly destroyed it in 1811. It is now a museum and national monument. The Danube is Europe’s second-longest river, originating in Germany and flowing southeast through 9 more countries before emptying into the Black Sea. Well-known tourist features along the Danube include the Wachau Valley, the Iron Gate in Serbia and Romania, and several nature reserves and national parks. Located on the Danube in northeast Austria, it is an important commerical center and the country’s third largest city.